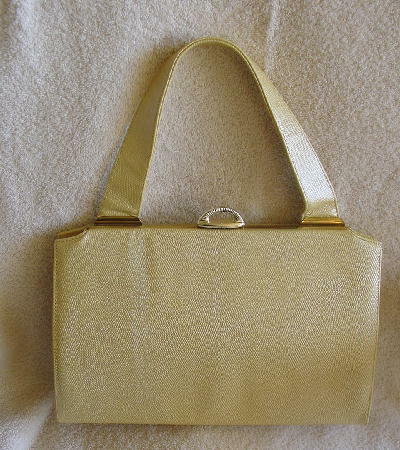 This vintage faux leather handbag has a creamy light butter yellow reptile embossed surface. 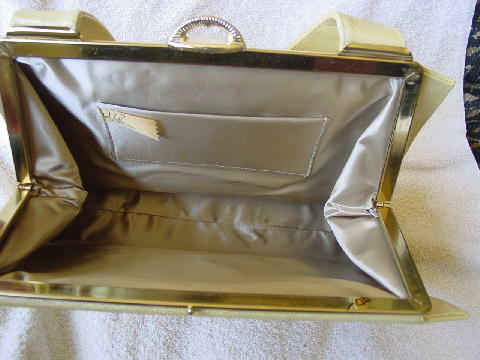 It has a gold-tone rim and ridged (with a cutout center) push tab closure. 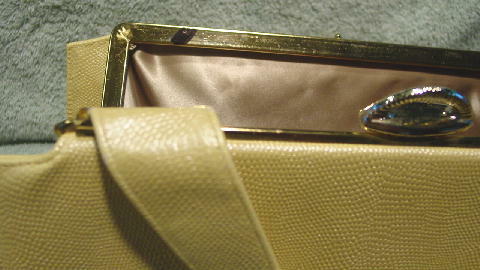 There is a sandy-champagne acetate lining with an open pocket. It has a 16" long handle and the purse is light in weight. The yellow coloring is missing on the edging of 2 front bottom corners and the back of the handle as it meets the metal strap holder. These spots are not really noticeable. There is a black mark on the inner top rim. The color is prettier and creamier in person. It's from a former Los Angeles model/actress.